Study: Does Your Salary Make Up For The Happiness You Sacrifice At Work? Study: Does Your Salary Make Up For The Happiness You Sacrifice At Work? [Study] How Much Happiness Do You Sacrifice At Work & Does Your Salary Justify It? When it comes to our lives and careers, one of the most fundamental questions we ask ourselves is am I happy? It’s an interesting question because happiness can mean something different to all of us. 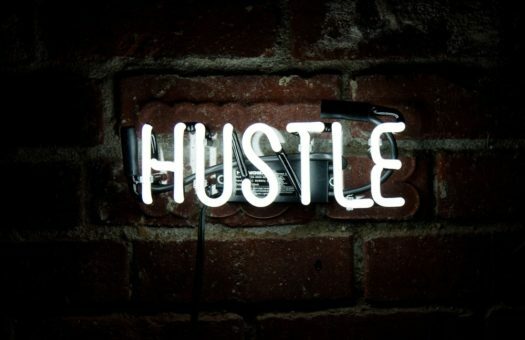 It could be an extra $50,000 in the bank, it could be projects that challenge you to learn and grow, or it could be flexibility to spend time with the family or start a new hobby. If you’re on a team of ten people at work, only one or two of your colleagues actually enjoy being there. Yet, the majority of us would rather spend an enormous chunk of our week at a place we can’t stand than to not have any work at all. One of the most robust findings from the Gallup poll was that being unemployed is even more destructive to our happiness than being employed at a job we hate. Do we work because it’s an obvious way to earn money and money leads to greater happiness? Is it true that everyone “has their price” where the salary they make justifies the hours and level of effort they put in? 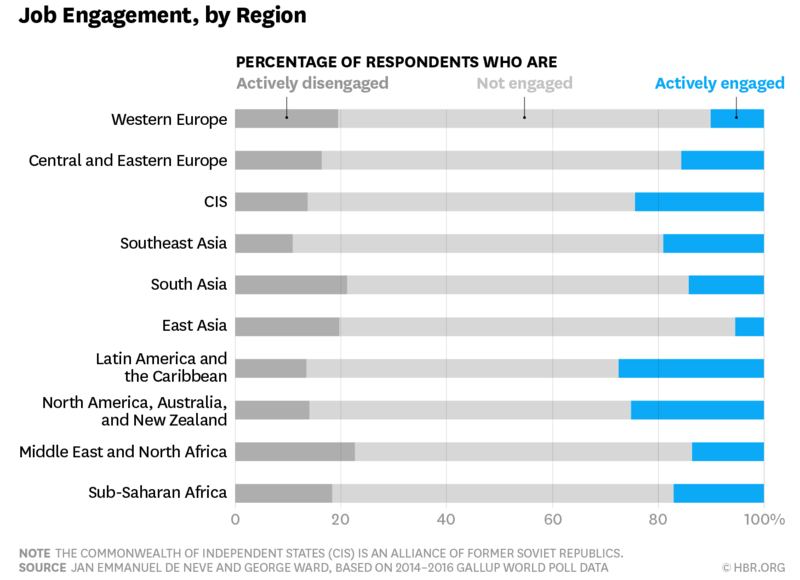 What are the 15% of people who are happy and engaged with their jobs doing differently than the rest of us? While large organizations like Gallup collect the data, few of them are going into the depth and detail required to accurately analyze it and uncover answers to these questions. We have to rely on other sources. 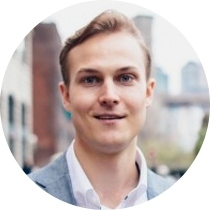 Hugo is the founder of a site called Tracking Happiness where he meticulously collects and analyzes data on different aspects of life as they relate to happiness. Thus far he’s tackled Sleep, Money, Love, and Work – all of which are still ongoing experiments for him. Let’s focus in on work. However, based on the Gallup data I mentioned above, we know that this isn’t true for the vast majority of people trading their time and happiness for a paycheck. 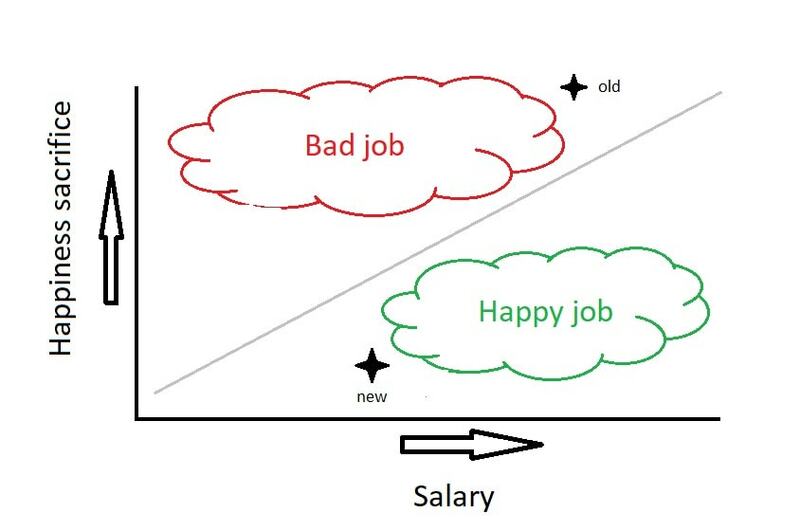 In order to answer that question, Hugo re-framed the question – how often does the salary accurately compensate for the lost happiness across the board? A couple of days ago, [a] poster here on r/fire mentioned that his new “cushy” job changed his perspective so much that he wasn’t that interested in RE anymore. He switched from a soul-crushing job which he hated to something that was much more easy going (even though it paid less). How much of our happiness do we sacrifice by working? Before the switch, this poster sacrificed a lot of his happiness for his job, and he was completely miserable because of it. Reading from his post, no salary would be able to justify that huge sacrifice. So he switched. Now he has a job that’s still slightly boring, but the happiness sacrifice is far less and it seems from his post that he’s much happier since he made the switch. To use the same example as before, the old job of the above mentioned reddit post was probably far above the linear line: Yes, they may have earned more, but (s)he was suffering every day because of that old job. His/her new job is in much better territory, despite paying less. I want to ask all of you to determine where your current job is located on the chart. We’ll start with the findings Hugo made after combing through the responses from each Reddit user. 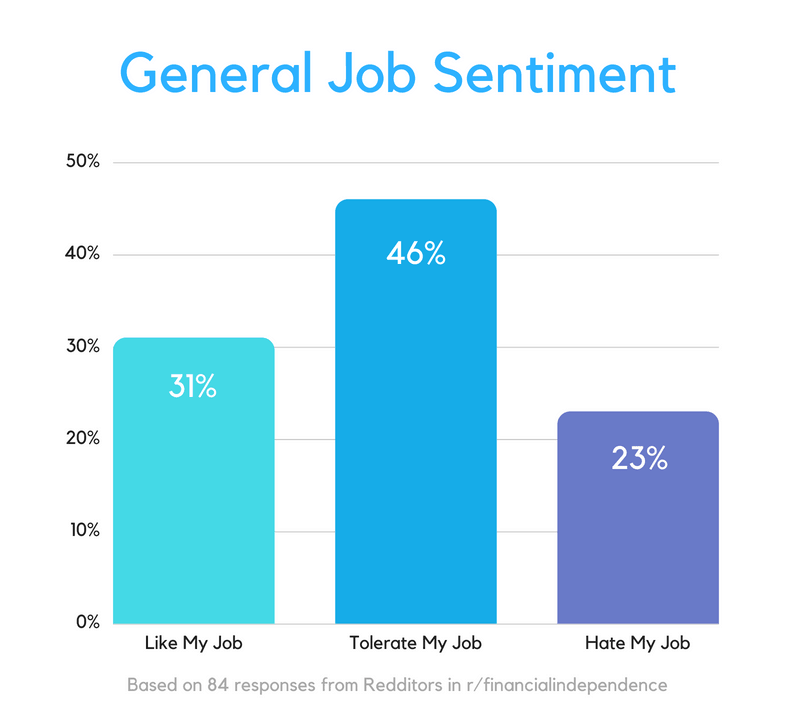 Graphical representation of the responses from Reddit users in r/FinancialIndependence, link to data here. 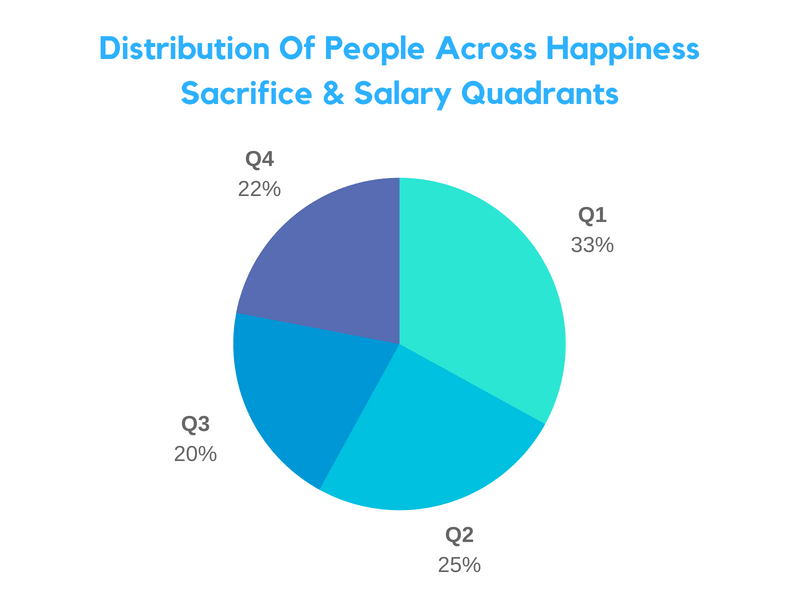 Quadrant 1: Situated in the upper right, Q1 represents people who sacrifice a LOT of happiness (>50%) but feel that their salary makes up for the sacrifice. Not a terrible place to be if money is a focal point. 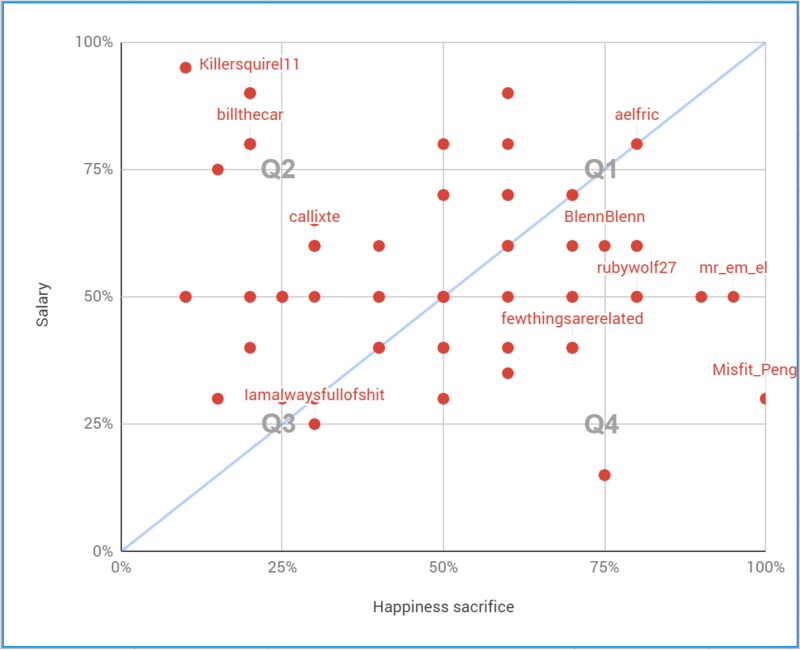 Quadrant 2: Situated in the upper left, Q2 represents people who sacrifice very little happiness (<50%) and the salary they make is effectively icing on the cake. These are part of the 15% of people who enjoy their jobs and get paid well for it. This is the best situation you could possibly be in. Quadrant 3: Situated in the lower left, Q3 represents people who don’t sacrifice very much happiness to be at work but also aren’t being paid extraordinary sums of money. Quadrant 4: Situated in the lower right, Q4 is one of the worst places to end up. These people sacrifice a high level of happiness for a salary that doesn’t even come close to balancing the equation. Based on the 42 data points recorded, 30% feel that they sacrifice a large portion of their happiness to be at work but their salary adequately compensates for the loss. Another 30% are fairly happy at work and their salary is icing on the cake. 21% of the group felt that the majority of their happiness was sucked out by work and their salary doesn’t come close to justifying that loss. Finally, 18% are working jobs that don’t significantly drain their happiness but they aren’t necessarily being paid incredibly well for their work. Happiness & Work: Is The Sacrifice Worth The Money? The Gallup numbers presented at the beginning of the article are staggering. The fact that 85% of people hate their job is insane, but if people are so unhappy with their careers, why do they continue to clock in every morning for 44 years of their life instead of calling it quits, packing a bag, and traveling the world? Based on the data that the kind Redditors of r/financialindependence gave us, the answer boils down to one thing: money. “I don’t like my job nor my field (I.T.) and I’d much rather spend my time indulging in my hobbies, arts and learning, and sailing around the world. That’s where I’m going for with FIRE. I also have no issues switching my job for more money. Which tripled my salary in the last 5 1/2 years and if all works out will double it again next month (new job). I’d rather play board games, make videos, spend time with my pets, cook, take pictures, draw, paint minis, learn new things, meet new people, sail around the world. Basically anything but my job. This answer probably isn’t that surprising. I recently ran a poll with the audience here at Cultivated Culture where I asked people if they would still show up to work if they received the same paycheck regardless of whether or not they were present. 67% of the people who responded said they would take the money and run. Only a small subset of the remaining 33% said they would continue to show up to work because they enjoyed what they do. Drawing a conclusion of “people work for the money” may seem obvious, but it’s fascinating to see the data behind it. 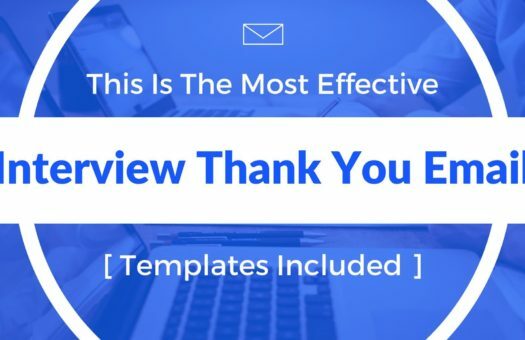 Moving forward, it would be interesting to see organizations like Gallup study they “why’s” behind people hating their job and turning them into actionable insights that companies and employees could use to increase engagement and happiness. In fact, the question of “will I be happy doing this?” typically comes in dead last, well behind the factors listed above, simply out of necessity. If it were incredibly easy to land a job and get paid well to do what we love, everyone would do it. 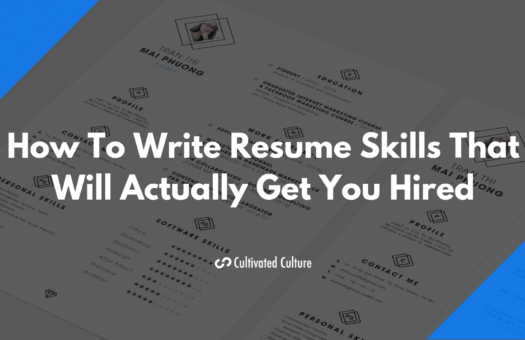 But the current job market and hiring process don’t make it easy, which is exactly why I started Cultivated Culture. I have a hunch that if more people knew how to “test” new career paths and take specific actions to land jobs in new fields, regardless of their background, we’d see a hell of a lot more people enjoying their jobs. The good news is that, if you fall into the 85% of people who feel disengaged and your salary isn’t making up for the happiness you’re sacrificing, there’s a way out. 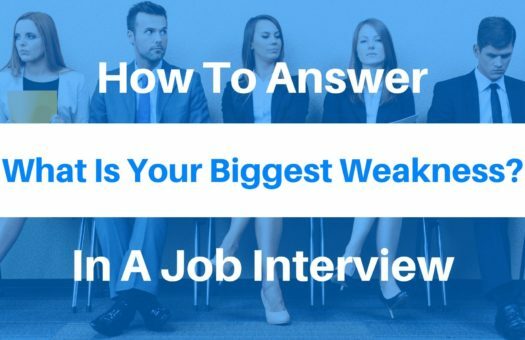 It starts with breaking the mold and taking an alternative approach to your job search. 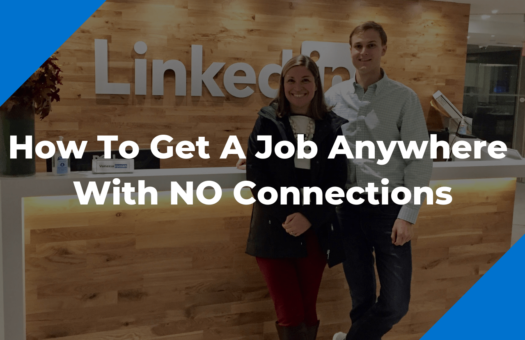 I lay out all of the steps and methodology to this unconventional approach in this post, which outlines my journey from miserable biology major with a job in medicine to landing jobs at Google, Microsoft, and Twitter with a 200% salary bump.